Our hobby was born in the dungeon. More specifically, it was born in what has come to be called "the megadungeon" or "the campaign dungeon" -- a vast, unclearable locale that serves as a "tent pole" for the entire campaign. While some gamers sneer at the megadungeon, believing it limited, artificial, and supportive of only a narrow range of play, the old school renaissance has wholeheartedly embraced it, in the process demonstrating that there are still depths left to plumb in the mythic underworlds of yore. Patrick Wetmore's terrifically named Anomalous Subsurface Environment is proof positive of this contention. This 88-page adventure module (available in both PDF and print versions, $13.49 and $17.57 respectively) presents the first level of a megadungeon that is quite unlike any other published to date. The closest comparison I can make is to Dave Arneson's "Temple of the Frog" from Supplement II, in that the Anoamlous Subsurface Environment (hereafter ASE) is a dungeon where gonzo super-science exists cheek by jowl with more traditional D&D elements. That's because this module takes place in a "dinosaur- and wizard-infested future of the Earth" rather than in a vanilla fantasyland. That's both an advantage and a drawback, as I'll discuss shortly. The setting material focuses on the Land of One Thousand Towers, so called because the landscape is dotted with the towers of wizards and the spires of ruined cities from the forgotten past. An important city within the Land is Denethix, formerly just another wizard-ruled despotate that is slowly -- and inexplicably -- becoming a more pleasant place. Naturally, Denethix is presented as a base for the PCs from which to launch their expeditions into the nearby wilderness and dungeons (including the ASE). What pleased me most about the setting material, aside from its creativity, was how remarkably useful it all is. Yes, there is some background, but it's brief and exists primarily to provide context to play. Likewise, the descriptions of locations are geared toward the kinds of things a referee would find helpful. Thus, we get lots of random tables and adventure hooks rather than pages of historical and cultural information that serve no immediate purpose. The Anomalous Subsurface Environment has no mastermind behind it, and no Big Bad Evil Guy waiting at its bottom for the players to confront to Save The Day. It does have a history, though; it has inhabitants with their own goals and desires, and it is full of mysteries for the players to discover and figure out. That's a very solid encapsulation of the philosophy behind old school dungeon design, too, come to think of it and one's reaction to it might serve as a good litmus test for how one might feel about this module. Anomalous Subsurface Environment offers no plot or story, instead providing a sprawling locale in which the referee and players can create their own stories, as they explore its chambers, interact with its inhabitants, and grapple with its enigmas. Speaking for myself, this is exactly what I want out of an adventure module, but then I'm looking for something that I can adapt to my own campaign rather than play straight "out of the box." If there's a flaw to Anomalous Subsurface Environment it's that, because of its gonzo science fantasy content, it might be of limited to interest to those who prefer their dungeons more traditional in tone. I can't really fault anyone with such a preference, but I hope no one will fault me for absolutely adoring what Patrick Wetmore has done here. The ASE is still recognizably a D&D-style dungeon; all the elements you expect to find are here. What's different, though, is both the justification for the dungeon and some of its contents. Thus, you'll find robots and laser pistols in addition to giant spiders and goblins. Of course, those goblins may still have 1-1 HD but their nature and goals have been warped by the Denethix Campaign Setting. In practical terms, what Anomalous Subsurface Environment provides is a "re-imagining" of D&D staples that does not fundamentally alter the play of the game except esthetically. Again, I think that's great, but others many not share my enthusiasm. Before concluding, I should point out what an attractive volume Anomalous Subsurface Environment is. The text is clear and well-written without the usual editorial mistakes one associates with amateur products. The cartography is similarly clear; it's not "pretty" or exciting to look at it, but I suspect that, at the table, the maps would be easy to use. The interior artwork, on the other hand, is terrific, particularly the work by Brian "Glad" Thomas. I own a hardcopy and it's a sturdy perfect-bound book about whose physical qualities I have nothing but good to say. In the end, Anomalous Subsurface Environment is a great adventure module for Labyrinth Lord and other old school fantasy RPGs. It's quirkier than most, making it a little harder to simply drop it into an existing campaign, but not so hard that it would prove a Herculean task. Moreover, the content is clever enough that any extra effort spent on retooling it would be well worth it. 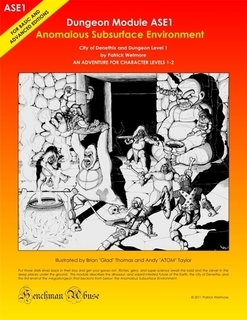 Even with only one level to its name so far, I'd say that the ASE deserves to be counted amongst Stonhell and the Castle of the Mad Archmage as one of the finest OSR-derived megadungeons, which is about the highest praise I can lavish upon it. Buy This If: You're looking for a science fantasy spin on the classic megadungeon or don't mind reworking one for use in a more traditional fantasy setting. Don't Buy This If: You can't stand science fantasy or don't want to have to rework an adventure module to remove references to such. Thanks for reviewing this - I had been on the fence but this clinches it. Can't wait to get a firsthand look. Best title EVAR. One comment - did you reverse the prices? "(available in both print and PDF versions, $13.49 and $17.57 respectively)"
Surprised the PDF is >> print. Yes, I reversed the prices. I've fixed it now. I'd be curious to know if the PDF sells at either price point. @James - Thank you for the kind words! Yeah, he did reverse the prices. And I've recommended it to a friend for running as a mini-con item with some friends to get them hooked on LL. Temple of Elemental Evil is about as megadungeon as I get, and it's a drag to me. Started running this on Sunday for a bunch of 4e-players using only the ASE book and my personal S&W hack. Easily the most immediately usable OSR product I've purchased. sounds like this would work as a Mutant Future thing too. Just ordered this bad boy on the strength of this post (and my own predilections, of course). Looking forward to it! Got my copy last week. Really impressed and looking forward to more! Just wanted to say, "thanks" to James for the kind words towards my artwork that I did for Pat and his great module...much appreciated! I've had a hard copy for a couple of weeks now and just this past Sunday I took it over my in-laws' to show them. Long story short, my in-laws live on the beach and every Sunday during the summer they have a bunch of their 50 and 60 something year old friends over to relax on the beach and have a potluck dinner at the end of the day. Anyway, I noticed many people over the course of the night perusing the module while sitting around and every single one of them came up to me and said, "man, this thing is cool!" None of these people have the first clue what an RPG is but they all found the writing very interesting and had nothing but nice things to say. The moral to this story is if a bunch of 50-60 somethings that have never gamed a day in their lives found it interesting, imagine what gamers will think. *The original piece for the cover is for sale (plus the interior pieces)for anybody that might be interested. Thanks again, James and Pat! With its science fantasy approach, would this be as useful for Mutant Future as for Labyrinth Lord? I think so, though it'd take a little work, since there are no standard MF monsters in the module, but that might be a plus rather than a minus. It's fairly large, yes, but not unusual for old school megadungeons. Mind you, the first level of my own Dwimmermount is only about 70 rooms. Your recommendation (and the recent Lulu sale) was enough to encourage me to grab a copy, and I must say that I do love the campaign setting and the nearby city. I think the pantheon of gods was a masterpiece. My internal jury is still out on the megadungeon itself, mainly because one level is not really enough to judge the dungeon as a whole, especially with the teasing mentions of lower level accesses and things buried deeper. But it seems quite sound.